8277. Louise HARDER (Leah HELWIG , Sarah Ellen SNYDER , Joel SNYDER , Lucetta BITLER , John Wolf , John , Johannes ) was born on 8 Feb 1942. She died on 24 Jun 2002. Louise resided in RD 1 Millville, Columbia Co, PA.
Louise married Herman Emil NORQUEST "Herm" on 10 Sep 1966. Ty NORQUEST was born on 23 Aug 1967. He died on 6 May 2005. 13742 F ii Laurie L "Laurie" NORQUEST. 8278. Jeff HELWIG (Karl Clinton HELWIG , Sarah Ellen SNYDER , Joel SNYDER , Lucetta BITLER , John Wolf , John , Johannes ). 13743 M i Guy HELWIG. 13744 M ii Graham HELWIG. 13745 F iii Michele HELWIG. 13746 M iv Matthew HELWIG. 8282. Bonnie OGAN (Elizabeth Margaret ZIMMERMAN , Russell Violus ZIMMERMAN , Elizabeth BITLER , Daniel , John Wolf , John , Johannes ). + 13747 M i Jack SHAFER. 13748 F ii Lisa SHAFER. 8284. Beth OGAN (Elizabeth Margaret ZIMMERMAN , Russell Violus ZIMMERMAN , Elizabeth BITLER , Daniel , John Wolf , John , Johannes ). 13749 F i Amanda HERRING. 13750 F ii Amber HERRING. 13751 F iii Ashley HERRING. 8292. Sheryl Lynn HOUSER (Robert Francis HOUSER , Agetha May ZIMMERMAN , Elizabeth BITLER , Daniel , John Wolf , John , Johannes ). + 13752 F i Stephanie Lynn DOVENBARGER. 13753 F ii Michelle Lee DOVENBARGER. 13754 M iii Christopher Sean O'CONNOR. Sheryl also married Lonnie HOLMES. 8293. Brenda Lee HOUSER (Robert Francis HOUSER , Agetha May ZIMMERMAN , Elizabeth BITLER , Daniel , John Wolf , John , Johannes ). Brenda married Kenneth Dean MINOR. 13755 M i Steven Dean MINOR. 13756 F ii Brittnie Nicole MINOR. 8298. Theodore Calvin HOUSER Sr (Herbert Harrison HOUSER , Agetha May ZIMMERMAN , Elizabeth BITLER , Daniel , John Wolf , John , Johannes ). + 13757 M i Todd HOUSER. 8299. Kenneth D HOUSER (Herbert Harrison HOUSER , Agetha May ZIMMERMAN , Elizabeth BITLER , Daniel , John Wolf , John , Johannes ). 13758 M i Cory David HOUSER. 8300. Le Marie HOUSER (William K HOUSER , Agetha May ZIMMERMAN , Elizabeth BITLER , Daniel , John Wolf , John , Johannes ). Le married Kenneth BALCHUS Sr.
Kenneth Patrick BALCHUS Jr 1 was born on 28 Mar 1994 in Pottsville, Schuylkill Co, PA. He died on 19 Mar 1996 in Shenandoah, Schuylkill Co, PA.
8306. Gary Lee PONZURICK (Lorraine HAUCK , Beatrice Katherine ZIMMERMAN , Elizabeth BITLER , Daniel , John Wolf , John , Johannes ) was born on 9 Oct 1952 in Shenandoah, Schuylkill Co, PA. He died on 18 Mar 2013 in Salt Lake City, Salt Lake Co, UT. Gary graduated from Pennsbury High School in 1970 in Fairless Hills, Bucks Co, PA. He resided in 1993 in St Charles, MO. He worked as owner with World's Best Distributing. Gary married [Female] on 25 Sep 1976. 13762 M i Matthew PONZURICK. 13763 F ii [Female] PONZURICK. 8318. Craig P FELLIN (Kenneth John FELLIN , Grace Manila TURNBACH , Phoebe Elizabeth BITLER , Daniel , John Wolf , John , Johannes ). 13764 M i Wade FELLIN. 8319. Maureen T FELLIN (Kenneth John FELLIN , Grace Manila TURNBACH , Phoebe Elizabeth BITLER , Daniel , John Wolf , John , Johannes ). Maureen married Victor D SMITH. Brandie SMITH [scrapbook] 1 was born on 23 Sep 1975 in Peninsua General Hospital, Salisbury, Wicomico Co, MD. She died on 23 Sep 1975 in Peninsua General Hospital, Salisbury, Wicomico Co, MD. 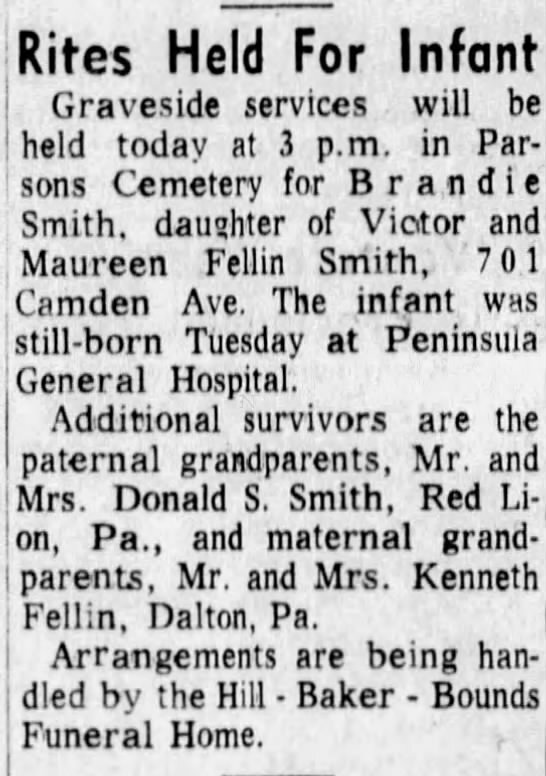 She was buried on 24 Sep 1975 in Parsons Cemetery, Salisbury, Wicomico Co, MD.